The Logitech Ultrathin Keyboard Cover for iPad and Ultrathin Keyboard Cover for the iPad mini have a very smart design -- combining three functions into a coherent product -- a Bluetooth keyboard, a tablet stand, and a protective cover. It's a Bluetooth wireless keyboard -- so you can more easily type with your iPad apps. The small membrane keys have enough travel for touch typing. And the keyboard includes handy cursor control keys for moving through clusters of text, plus shortcut command keys (copy, paste, undo). 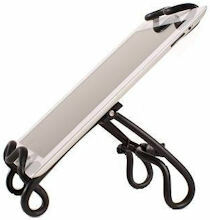 It's a tablet stand -- with an integrated slot to hold your tablet at the right angle while you are typing. The recessed groove runs behind the keyboard, so you can position the tablet vertically or horizontally. And it's a protective cover -- to store and carry the keyboard along with your device. It's sized to fit the tablet and protect the touch screen, and snaps on with magnetic clips to attach securely -- and supports instant on/off, like the Apple Smart Cover. 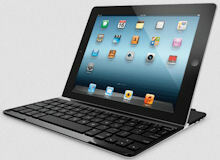 The keyboard cover is well made, with an aluminum design that complements the iPad. Yet it's remarkably thin and light, at 10 mm thick / 12.5 oz. for the iPad, and 7.3 mm / 7.3 oz. for the iPad mini. It charges through a miniUSB port, with enough charge for 6 months of use for the iPad version and 3 months for the iPad mini (assuming 2 hours of use a day). The Logitech Ultrathin Keyboard Cover for iPad is available for $99 ($73 street) in standard black or white, and now more exciting red or purple. The Keyboard Cover for iPad mini is available for $79 ($68 street) in black or white. Logitech also offers personalization of the cover with laser engraving at no additional cost. This is a very clever approach to providing a useful keyboard for a tablet -- so that you can type like you are using a laptop, and then pack it up as conveniently as closing a laptop cover. See my Holiday Gadgets & Portable Accessories 2013 coverage for more on portable devices. You may think you know CyberLink from years of using PowerDVD to play and explore DVDs on your PC, and also seeing its backup and burning bundled across a wide variety of DVD players and Windows systems. 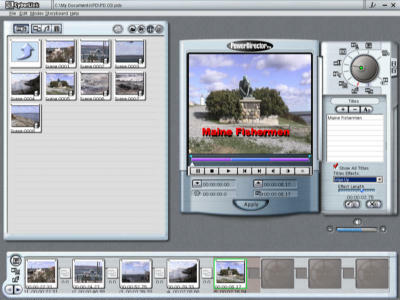 But CyberLink has been leveraging its technology in video compression and display much more broadly -- particularly in its PowerDirector video editor, which I've been covering at least since version 2 from February 2002 (see screenshot), and which has just been updated to version 12 from version 11 last year (see previous post). The early PowerDirector was clearly a consumer tool, with a simple storyboard and a very modal interface for different functions, controlled by the dial in the top left corner. But as CyberLink has expanded its technology over the past decade, it also has focused on interface design to organize the plethora of capabilities in a clean and approachable way. In addition, CyberLink has expanded its digital media product line into a full PowerDirector 12 suite with audio and color tools -- now upgraded with AudioDirector 4 for audio-for-video soundtrack editing and ColorDirector 2 for video color grading. Plus, CyberLink has added a photo editor and manager, also upgraded to PhotoDirector 5. And while the majority of these tools are for Windows only, PhotoDirector also is available for Macintosh. Then there's the tablet world, where CyberLink has introduced PowerDirector Metro and PhotoDirector Mobile, available separately or bundled with the new releases of their namesake tools. These are currently only for Windows 8 tablets. One interesting example of CyberLink's approach to building technology into applications is the way it shares filters and effects between photo and video editing. So as PhotoDirector 5 adds Bracket HDR (High Dynamic Range) processing to merge multiple exposures into a single high dynamic range image -- the same idea also moves into ColorDirector 2, with the HDR Video effect to add expanded dynamic range and a visible pop to video segments. - PowerDirector 12 already had video analysis to help select scenes and 3D and 4K Ultra HD editing, and now adds multicam editing of up to four tracks (to add in that GoPro footage), and a motion blur effect for picture-in-picture and animated titles. - ColorDirector 2 already had extensive color correction tools and motion tracting support for color enhancements, and now adds High Dymanic Range video. - Audio Director 4 extends its spectral visual restoration with new background noise and hum removal, and a Surround Sound Panner for 5.1/7.1 multichannel audio. - PhotoDirector 5 steps up to 64-bit processing, adds High-DPI support for high resolution monitors, provides auto lens correction for over 60 popular DSLR lenses, and exports slideshows in glorious resolution as 4K UltraHD video. PowerDirector 12 Deluxe starts at $69.99, or $99.99 for the Ultra version with 64-bit / high-def support, or the Ultimate version for $129.99 with bundled NewBlueFX effect packs and CyberLink Creative Design Packs. ColorDirector 2 Ultra and AudioDirector 4 Ultra are each $129.99, and PhotoDirector 5 Ultra is $99.99. CyberLink also offers a variety of bundled suites, including the full Director Suite 2 for $299.99 with all of the above, and the Ultimate Suite for $249.99 without PhotoDirector. For a technology-centric company, CyberLink has done a great job designing these applications, pouring in these cutting-edge technologies while still not overwhelming users with features and options. CyberLink also has worked to develop its DirectorZone.com online creative community, with tutorials and user-contributed content, now including over 400,000 free effects available for download. 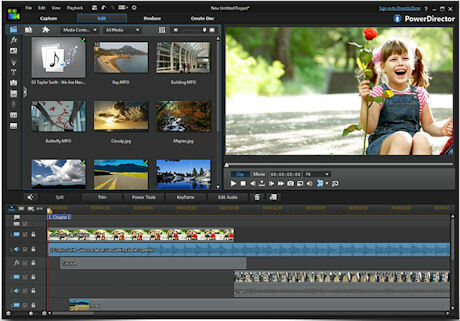 Adobe is revealing some details of the next full upgrade to its video tools this week at the annual IBC 2013 Exhibition. A new update to the seven Creative Cloud for Video applications is due to be released in October (see earlier review). Adobe is rolling out over 150 new features -- featuring support for UltraHD, with a DirectLink integrated pipeline from Premiere Pro to SpeedGrade for color grading. After Effects also adds enhanced upscaling for transforming from SD to HD to digital cinema sizes, and mask-based tracking. The Adobe Anywhere collaborative workflow platform extends across Adobe Prelude for shared ingest and logging, Premiere Pro for editing, and now also After Effects for effects and motion (see earlier review). These are part of Adobe's new Creative Cloud strategy, offering software only through subscription (see earlier review). In this new model, Adobe continues to produce major updates to its extensive suite of production tools -- but now you can get the upgrades as soon as they are available, and at no additional cost. See full article -- Adobe Creative Cloud Updates for 4K in Premiere Pro -- at Videomaker.com. VOXX International is a consumer electronics and accessories company with brands including RCA, Acoustic Research, Jensen, and, of course, Audiovox. This gives the company an amazingly broad range, and the impetus to develop slightly different products that deliver technology at consumer pricing in interesting ways. One example is the Acoustic Research Portable Wireless Speaker (see earlier post), made for weather-resistant carrying and sharing outside, with clever ideas like a built-in storage compartment and the ability to customize the look with designs from Skinit. 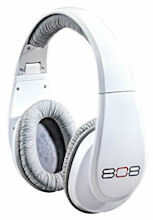 Then there's the VOXX 808 Studio Over-Ear Headphones, which provide great sound at an amazing price of around $40 (street). These are not terribly fancy, with an hard acrylic molded shell and synthetic leather earcups -- plus head pad for wearing comfort. They are full over-ear, to provide noise isolation. And they feature a 40mm driver, with emphasis on the low frequencies for bass lovers. For convenience, the 808s are foldable, with metal hinges and sliding extenders, to pack into the included carrying case. And VOXX has included two detachable, tangle-free cables cords that you can swap -- a "DJ-style" heavy round cable for focusing on the music, and a flat cable with an inline play/pause control and mic for phone calls. A 6.3mm adapter also is included. The result provides impressive sound at a very reasonable price under $100 -- and especially now at around $40 (street). They're available in gloss white, or gloss or matte black. See my Holiday Gadgets and Wireless Accessories 2013 coverage for more on portable audio and other fun devices. Damson Audio is a new company from the UK that develops wireless speakers that transmit sound through the surface that they are sitting on -- The surface acts as the diaphragm, so you hear and feel the sound. Damson's Incisor Diffusion Technology amplifies through resonating surfaces such as wood, glass, metals, or cardboard. So you can have lots of fun experimenting with spreading the sound on a table, box, car hood, window, refrigerator, or even through a coffee cup. The Damson Twist wireless Bluetooth speaker packs this idea into a solid aluminum cylinder, roughly half the height of a small soda can, and the weight of a full can (2 1/4 in. radius, 2 3/4 in. high, 12 oz.). It has a sleek, minimalistic design, with no buttons. Simply twist to play, and it will connect to your Bluetooth device (phone or tablet) -- and music playback will resume without you having to push or tap or select anything. The Twist has an input 3.5mm jack so you also can use it with any wired device (like a laptop), plus line out to daisy chain. It charges though microUSB, and plays up to 4 hours wireless, or 9 hours wired. The Damson Twist is available for $69.99, in black, blue, red, or silver. There's also a Mounting Bracket accessory with a suction cup for $24.99, to use the Twist on vertical surfaces (see photo). It screws into the metal threaded base on the Twist for a secure fit. Than you can resonate on glass, or the fridge, or in a car -- or on a window, so you can hear the sound on both sides. You got your metal stands, and your plastic stands -- built solid to securely hold your smartphone or tablet. Then there's the Kribbitt Universal iPad and Tablet Support Stand -- something definitely different if you want more flexibility in setting up a tablet to view or play. Out of the box the Kribbitt stand looks like a spaghetti mix of curved wires. But as you pick it up and start to play, it begins to separate out into components. There's the base built around a center support bar, with the front and back legs each formed from twisted wire. The tablet nestles in the cradle on the front, and then you can adjust the legs for any viewing angle. The center bar even has wing nuts on the ends to adjust the tension. Then, to hold your tablet securely, there's a bungee cord with another twisted wire to hook over the top of the tablet, and then adjust until it's held firmly. The wires are enclosed in colorful plastic tubing, which provides a firm grip -- both for holding the tablet snugly, and for sitting securely on surfaces. Then comes the fun part -- adjusting the Kribbitt to your personal preferences. For hands-free use you can set it up for landscape or portrait orientation, adjust the viewing angle, squeeze the cradles to fit different tablet thickness, and even tweak the legs to level on uneven surfaces. For more personal use, you can rest the Kribbitt on your leg by pulling the front and back legs further apart. And it provides a firm grip when you are holding it. The Kribbitt Universal Tablet Support Stand works with the iPad and other tablets. It's available for $39.95, in black, silver, green, blue, and pink. Entries posted to Manifest Tech Blog in September 2013, listed from oldest to newest.